How does the shovel and axe fit on the side of the MB/GPW? The axe handle goes through a loop just behind the step. The shovel point goes in a bracket above the the point where the front fender and the step meet. What do you mean by “motor pool” restoration? The top of the line would be National Judging. These are strictly show jeeps. Most customers are not interested due to cost and that they are not good driving jeeps. Second would be Motor Pool. In other words motor pool ready as a soldier would pick up to go on a mission. Complete running, reliable, etc. Third would be Combat Class. This would be a motor pool vehicle but have combat type gear added to it; guns, packs, etc. Also may show “damage” from combat use- bent bumper or fender, scratched up paint, etc. Then there are projects – jeeps not ready to run at all, needing work or complete restoration. Must I use epoxy primer with the TM9 Ordnance paints? Enamel paint can be applied to most any clean surface. It will adhere to single and 2k stage primers (epoxy, urethane). It can also be applied on top of most other paints. Urethane paints MUST be applied to 2k primers only. If urethane paint is applied to a single stage primer (no catalyst) then the primer will fail when the paint cures and it will lift. Urethane paint CANNOT be applied on top of enamel paint. Urethane paint cannot be delivered in spray cans since it requires a catalyst. What is the XL conversion kit? The XL conversion kit was designed to provide more leg and belly room behind the steering wheel. It consists of a modified drivers seat frame and two wheelhouse pockets. You must cut your rear wheelhouse and weld the pocket into it. This give the driver an additional 3″ of space behind the wheel. A pocket is provided for your unmodified passenger seat so the seat frames line up. Can I use the XL seat kit that you sell for the WWII jeep in a CJ2A or other models? 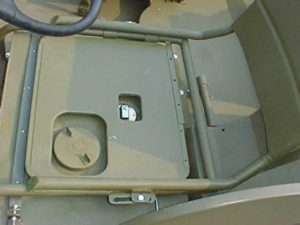 Due to the fact that the gas filler is under the seat cushion on the WWII jeep, the MB XL seat frame is designed in such a way that the bottom of the frame stays in the original position. 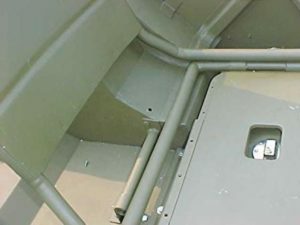 A pocket must be installed in the rear wheelhouse and the legs of the frame are lengthened so the seatsits back into that pocket. Since this is not a problem for “newer” models due to them having side-fill gas tanks, if you wanted the same effect, you could weld pockets into the rear wheel wells and, rather than using the XL seat frame, modify your current seat by cutting the front leg tubes and sliding the seat back into the wheelhouse and then welding in a spacer. Do you rebuild T-84 transmissions? How much does it cost? The countershaft, small parts kit, synchronizer and/or it’s blocking rings depending on their condition, reverse idler shaft, gasket set, rear bearing, and front bearing. The counter gear often has to have new bushings put in it at the machine shop. Disassembly and cleaning takes about 3 hours labor as does reassembling. If case or gears are found to be damaged, price can quickly escalate. We have received some cases in which the front bearing no longer fit, in this case the machine shop has to bore out the case and install a ring and bore it to the correct size of the bearing. All these procedures are rather costly. When calling or emailing us for a price estimate, please answer these questions – Do you know what condition your transmission is in now? Is it running? Has it been sitting for years? If it has been sitting for many years, remove the top cover and rotate the gears. As you know, oil floats on top of water. We have received transmissions in the past where the gear teeth were rusted almost off in the bottom where the case had water in it for 20 years or more. Why is the MB/GPW windshield frame dented in the front near the top on the driver’s side? This dent is the only way you can remove the inner windshield frame from the outer frame. 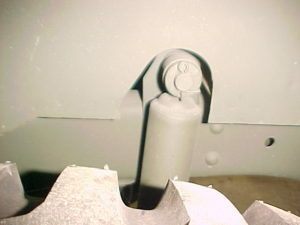 If replacement or repair of the inner frame is required, you open the inner frame fully and slide it toward the driver’s side out of it’s hinge channel. I have had customers in the past who actually welded this area in, thinking it was not correct. Do you have, or can you get, CJ2A frames? Yes, we have CJ2A frames. What gauge steel is used on the BEMAK reproduction bodies? Steel thickness of reproduction bodies is as close to original as possible. Much of the steel overseas is sold in MM thickness, not gauge thickness. You will not find the bodies to be thin. They are very close to original in weight. What is the MB-2A kit? 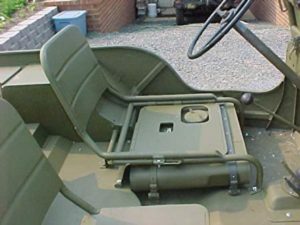 The MB-2A kit is designed for the customer who wishes to have the MB/GPW WWII jeep-look but can not find an original MB or GPW to restore. Many customers find CJ2A and CJ3A jeeps to be cheaper and request a WWII looking body to fit. We thus developed the MB-2A body kit. It is basically an MB kit, including all the WWII features – i.e. low windshield frame, tool boxes, shovel and axe location, no tailgate and small head lights. The major difference is that the front floor is modified to accept the T-90 transmission. All accessories – seat frames, gas tank, headlight buckets, must be MB type to fit. Some modifications must be done to the CJ2A frame before mounting this kit. Since the MB gas tank hangs down over the frame, the two out board frame to body mounts under the gas tank need to be removed. They can be relocated to the inside of the frame. Rear shock brackets on CJs lean front, on MB they are straight up and down. The body will have the pockets in rear floor so you can relocate the brackets. You will also need to switch the left and right hand leaf spring shock mount plates to position the shock to rear of axle. If you do not wish to do this, the bracket can be left in CJ2A position and it will clear the MB-2A body tub. The 12 volt CJ3As have a larger battery tray. This interferes with the MB inner fender, requiring modification or use of CJ3A or M38 front fenders. In addition, CJ3As do not have front bumper gussets. If you wish, they can be added with some cutting and welding, although this is not required. This kit is ideal for a parade or living history group restoration as the CJ2A and 3A jeeps are easier to find and are usually less expensive to buy. Also the T-90 transmission is better than the WWII T-84 transmission.